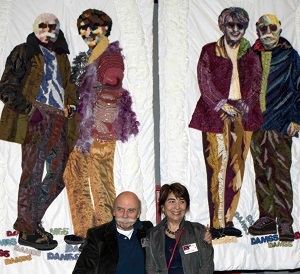 Norma Minkowitz is an internationally renowned textile artist. Her artworks express a decidedly personal style that makes her art absolutely incomparable. 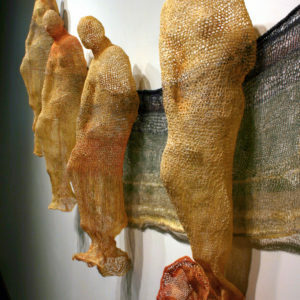 Norma creates figurative sculpture, fiber drawings and transparent forms which show a sometimes apparent fragility and which are connected with human and natural forms. 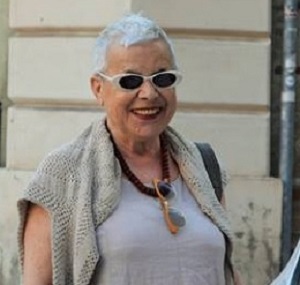 Her artworks are present in 32 museum collections and numerous private collections. Norma, how did your passion for crochet begin? I have always been interested in linear elements. 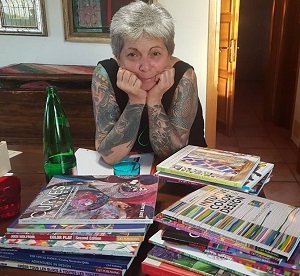 When I was a young girl I spent many hours drawing with pen and ink, as well as learning to crochet at my mother’s side. She gave me a great deal of encouragement as well as scraps of fiber and I taught myself to manipulate the threads into sculptural forms at a young age. My first efforts were making round doilies and until this day I always start my sculptural and flat work with a circle. I love the freedom of crochet and the ability to go in different directions creating movement with the line as well as the inclusion of flat areas that become a canvas for the application of other materials and objects. Creative instincts run free with crochet. 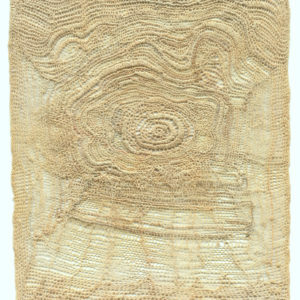 My art is based around the repetition of one stitch which I feel has a meditative and spiritual power. It was not until the 1960’s that my love for drawing merged with my fascination and need to crochet with fiber. 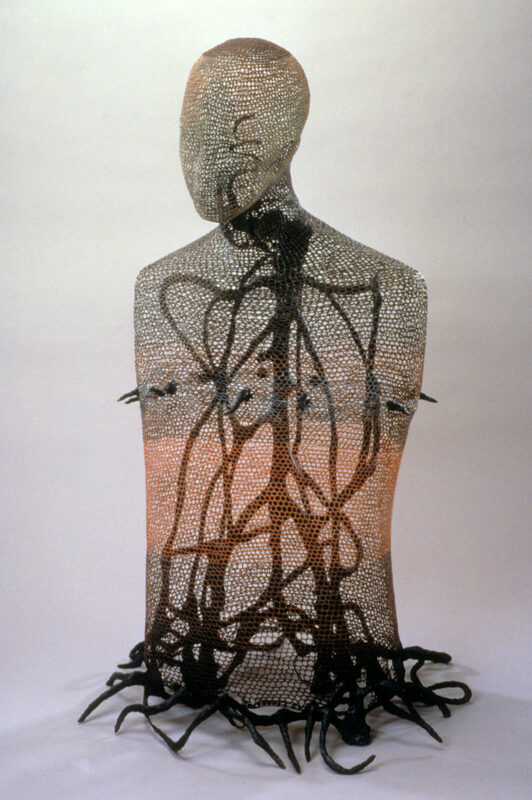 How did the idea of using crochet to make sculptures come about? I started crocheting by making circular doilies and as a girl I realized that I could skip stitches after creating a circle. I would then have a form that could be a head and then instinctively I began to cover my dolls with these round hollow shapes. By adding stitches it would enlarge and become a shape for the body. Of course when I finished I could not remove the crocheted part and the doll would become encased in the fiber covering. I then started making dolls without a real doll inside. These personal and unique dolls became solid forms as they were stuffed with batting. That is how my first interest in sculptural forms began. 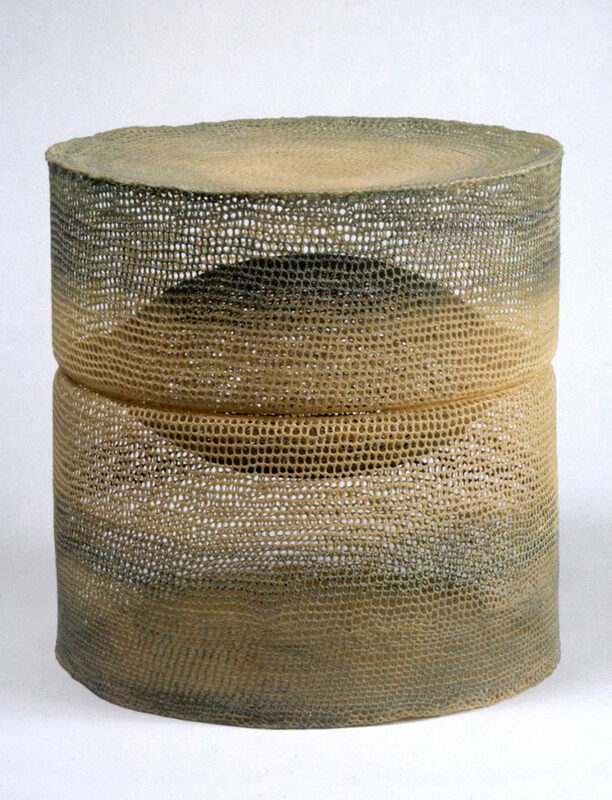 Many years later at the beginning of my professional life in the early 1970’s I was drawn to the concept of containment, simultaneously revealing and concealing. I started making transparent vessel forms creating numerous sculptures that are now all in Museum and private collections. 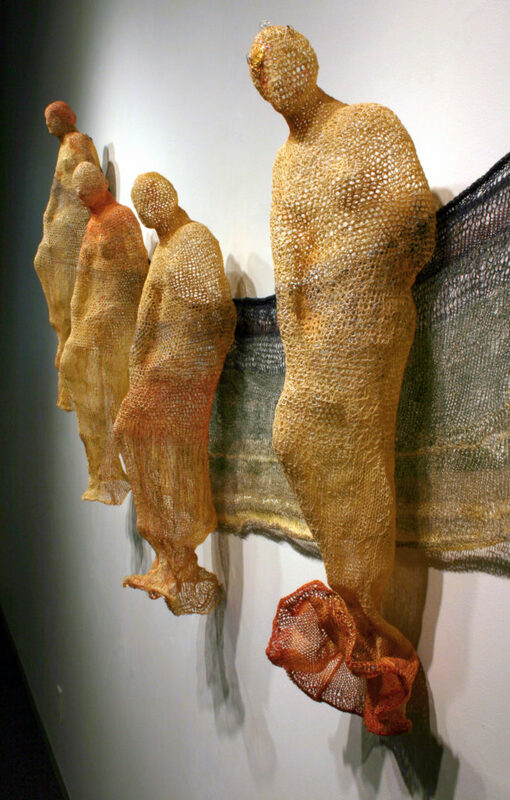 I explored the possibilities of crocheted, interlaced sculptures stiffened into hard mesh like structures. 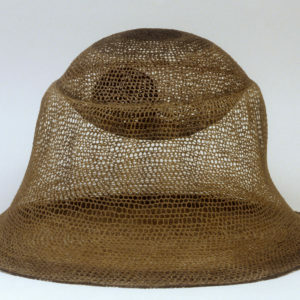 The blurred web-like fabric defined volume and form. Process became part of the content and both structure and surface were achieved simultaneously. 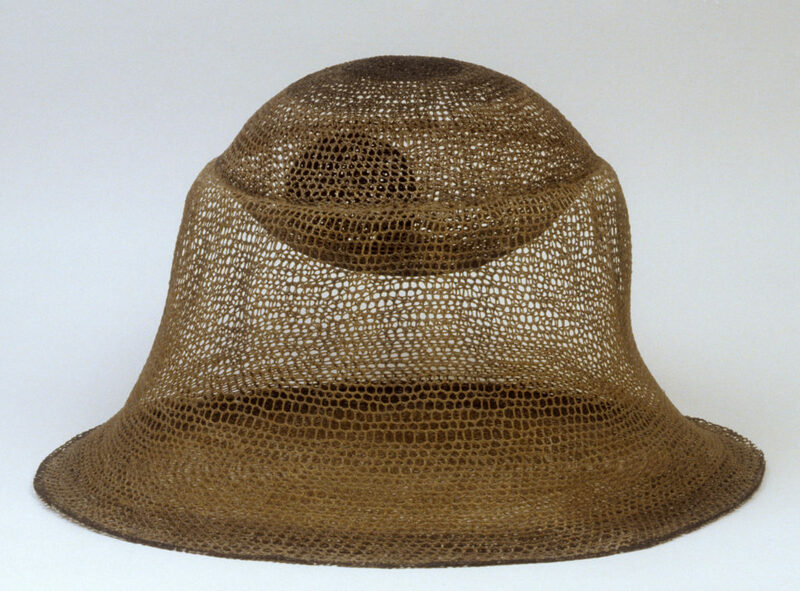 These netted sculptures often made statements about my interest in enclosure and entrapment. 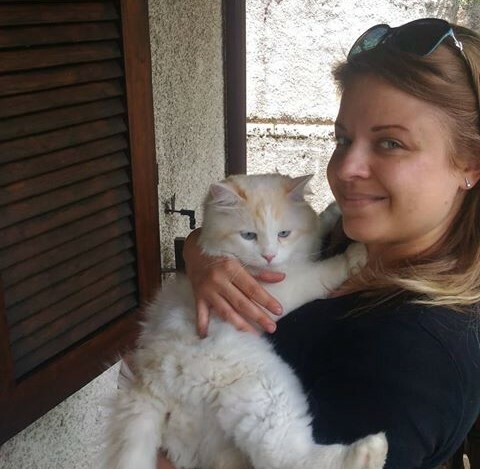 They could suggest the safety of a shelter or a cage from which there was no escape. 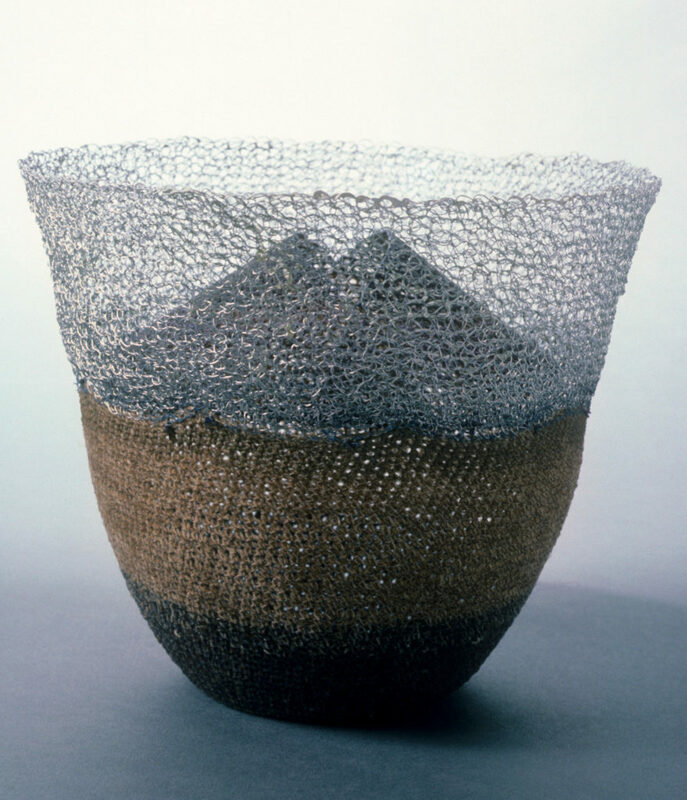 The effect of the transparency also allowed me to put objects and forms within the vessel creating works that weave the personal and universal together. I strove to develop a personal language. I felt this direction to transparency and delicacy related to my interest of the drawn line. 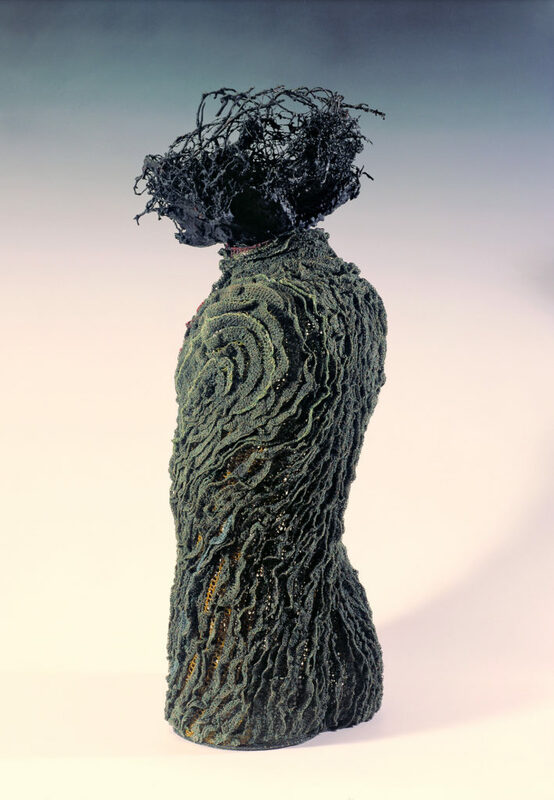 As far as your figurative sculptures are concerned, how did they evolve, how did they change from the first works to today? As I exhausted the possibilities of the many enclosed vessel forms I created, I turned to my interest in the human form. Most of my pen and ink drawings created at the Cooper Union Art School and later in my studio have been about the human body as well as the human condition. 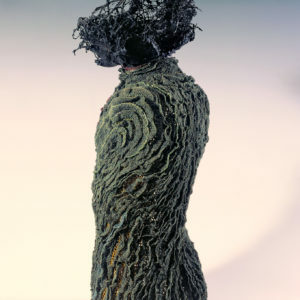 I now returned to the idea of using the figure in my sculptures. These were at once much larger and more complicated than the vessel forms. Continuing in the technique that I invented for myself, I strove to express the human figure (mostly female) at times as mysterious and ephemeral. The sculptures were transparent and ethereal conveying the human condition. The linear effect always inspired me to this visual direction. It also was connected to the cross hatching of my pen and ink drawings. 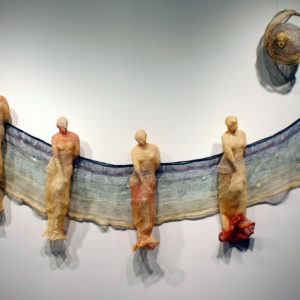 These veiled figurative sculptures were mostly created in the 1990’s to the mid 2000’s. I still exhibit them and create new ones, but my work continues to change. 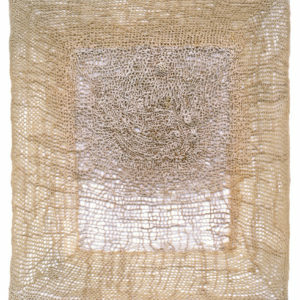 In 2007 I started using modeling paste which has a plaster-like consistency to fill in the spaces of the fiber’s open netting. This process creates a surface that focuses on and highlights the lines. I drew with stitches, introducing a bas relief surface of concept, energy and movement. I often highlighted the lines with colors of paint. The concept of the figure was now bolder and darker in concept. My work continues to change. Thanks to the use of threads and transparency, your sculptures take on appearance of fragility and lightness, which contrasts with the idea that the sculpture is something heavy. What more precisely is the role of the empty spaces, negative spaces in your work? 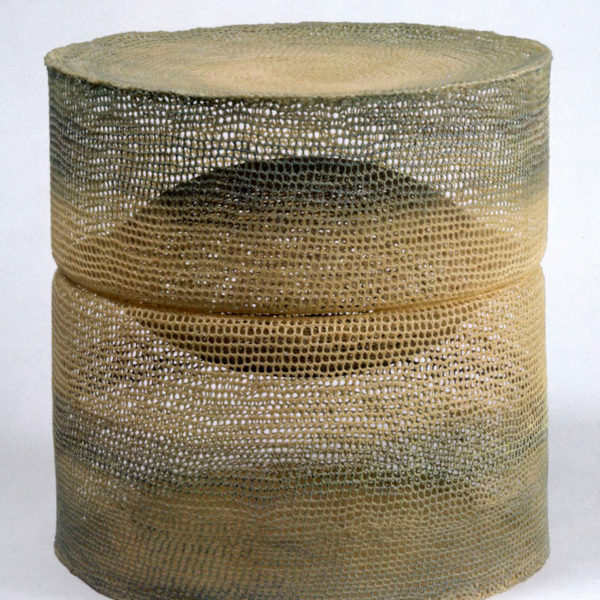 My work with outer netting creates mystery by obscuring the shape within creating a sense of ambiguity in the shadows of the work. I continually delve into the dark side of life as well as the passage of time and other transitions. 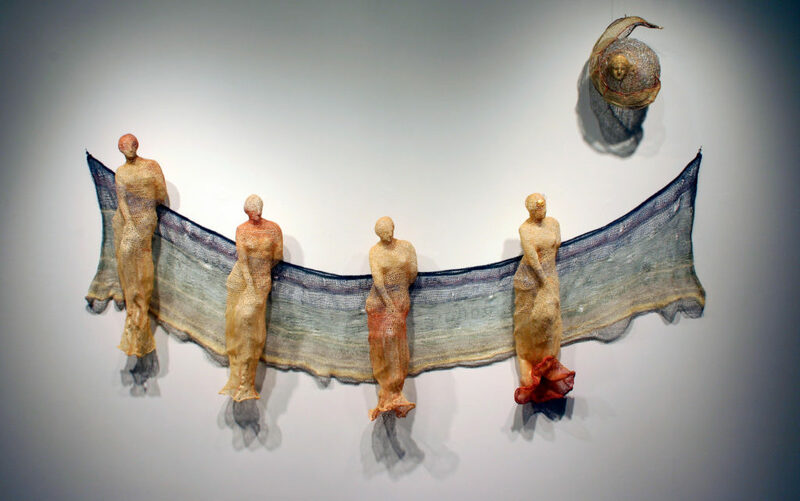 The transparency of my sculptures work well with the use of interlaced fibers where objects may be hidden inside, but visible from the outside. Despite the repeated use of the same basic stitch, which to me has a spiritual quality, no two are exactly alike. This conveys the intimacy and imperfection of the human hand and makes the work more powerful. I want to simultaneously express fragility, delicacy and power, the complex and the simple. 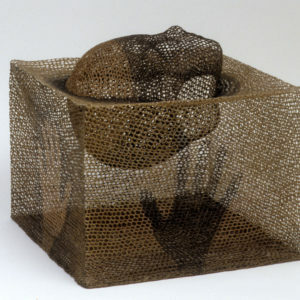 I feel the open mesh gives a feeling of ethereal lightness but also implies the concept of three-dimensional strength. 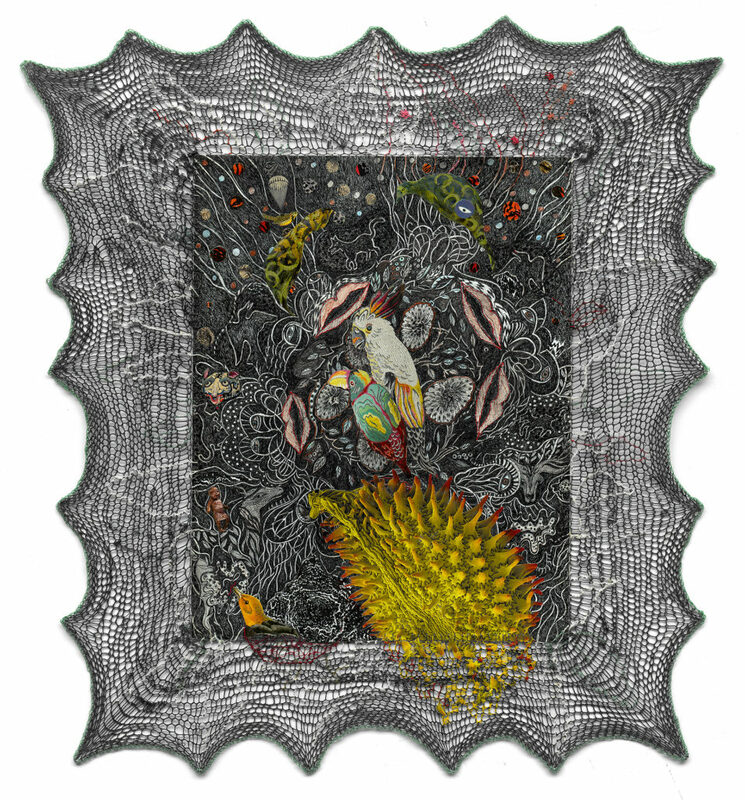 My work with negative spaces retains implications of containment and psychological complexity. 5- How do you choose the subjects of your sculptures, what inspires you? Do you love classical art and mythology? Like most artists there is a need to express an idea, tell a story, and remember a memory or perhaps the unknown. 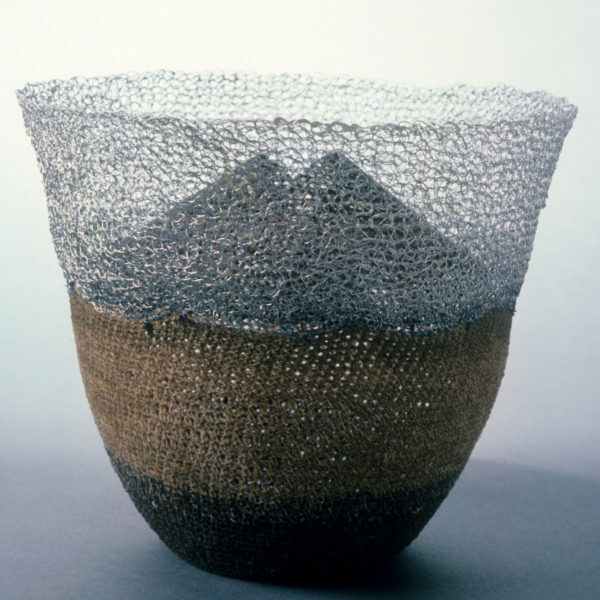 In my earliest works, I was inspired by the minimal vessel form. 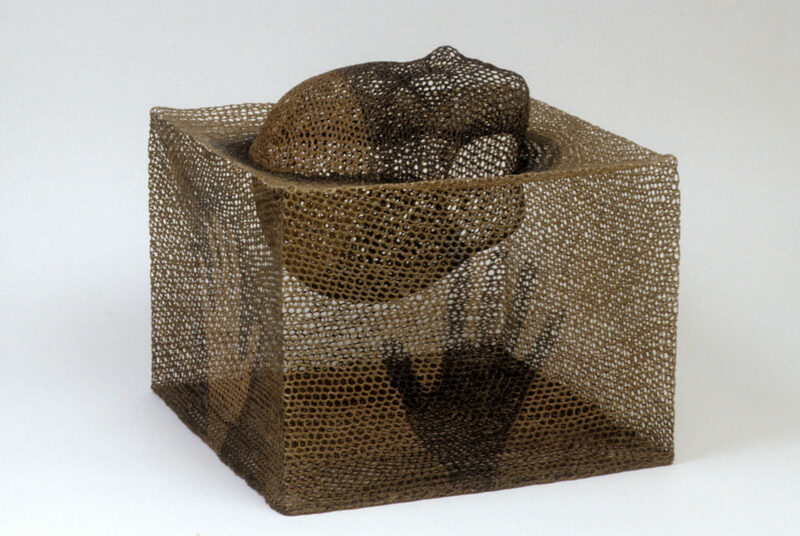 These vessels developed into transparent sculptures that addressed the possibilities of cages with no chance of escape or perhaps shelters that protected. Many of my figurative sculptures were inspired by the human situation, psychological complexities and other personal stories. They often express themes and thoughts addressing mortality or perhaps immortality, fears and relationships .I also think about the passage of time, creatures of mythology and the changes in the human condition. Several of my sculptures are sequential installations that use the female form as a symbol of the ephemeral and are of classical subject matter such as Venus “ Goodbye Goddess “ is one such piece and is in the collection of the Wadsworth Atheneum a Museum in Hartford, CT. I am also inspired by the power, grace and darkness of birds of prey and have often used them in my work. I sometimes work with objects that were once living like flowers, twigs, bones or even food. These objects speak to me through their shapes and suggestive qualities and transition of life to death. I find the subjects of my work evolve as I work with chosen materials and I start feeling the path and inspiration develop. I do not preplan my art. If I knew what is would look like before I started, I would not be excited to create my art. How is your work evolving over time since you started in the 1960’s to the present day? My work keeps evolving, but at times I seem to go back to an earlier period with different results. I currently have started another vessel form but in a different way by using metal wire as well as a new wearable art work. 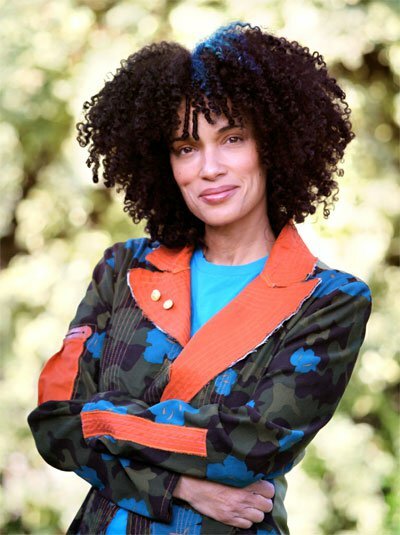 In the 1980’s I also created wearable art and exhibited with Julie Artisans Gallery a remarkable space for wearable art in NYC. She wrote an outstanding book in 1986 on wearable art which I am part of called “Art To Wear” published by Abbeville Press NYC. It is still available. The photography and art work are stunning. So, I go back and forth with different results but similar themes. 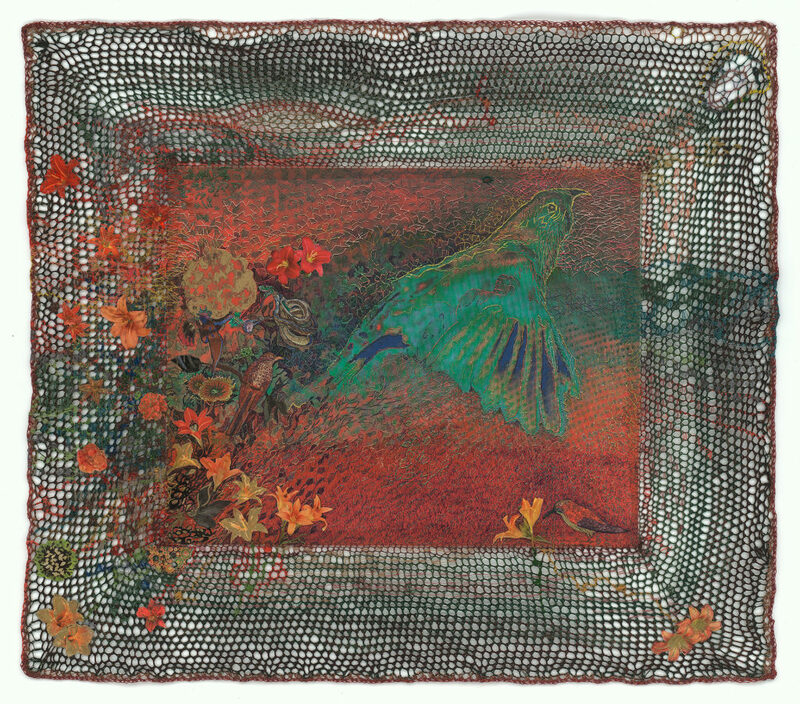 I am currently doing pen and ink drawings with collage, stitching and intricate free form crocheted borders. 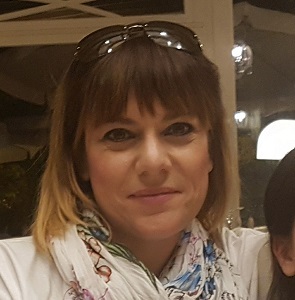 They have been received very well and I am excited with this new direction. I am also doing larger wall hangings, crocheting the background which becomes my canvas and then start applying stitched lines, shapes, found objects and more. You use very fine threads, why not instead prefer thicker yarns and maybe easier to work with? I love very fine threads; they are like using a crow quill pen and making detailed overlapping crosshatched lines. I could not do that with heavier threads. It also gives me the option of working with several thin threads at a time and changing one or two of the threads to create subtle changes of color. Because of the lightness of the fibers weight, I can also cut out parts to make changes. My work is based on the repetition of one stitch which I feel is more effective in expressing my concepts with the use of fine thread. There is much labor in my work and I like that element of my process. I have time to think about what I am doing and to make changes. I like the look of the fine threads. My work is very personal and unique to me. What’s the connection between your ink drawings and stitchery? Drawing continues to be important to me and I find the threads and wires I use mimic the patterns and movement, as well as the irregularities of my pen and ink drawings. My sculpture evolves into three dimensional drawings. 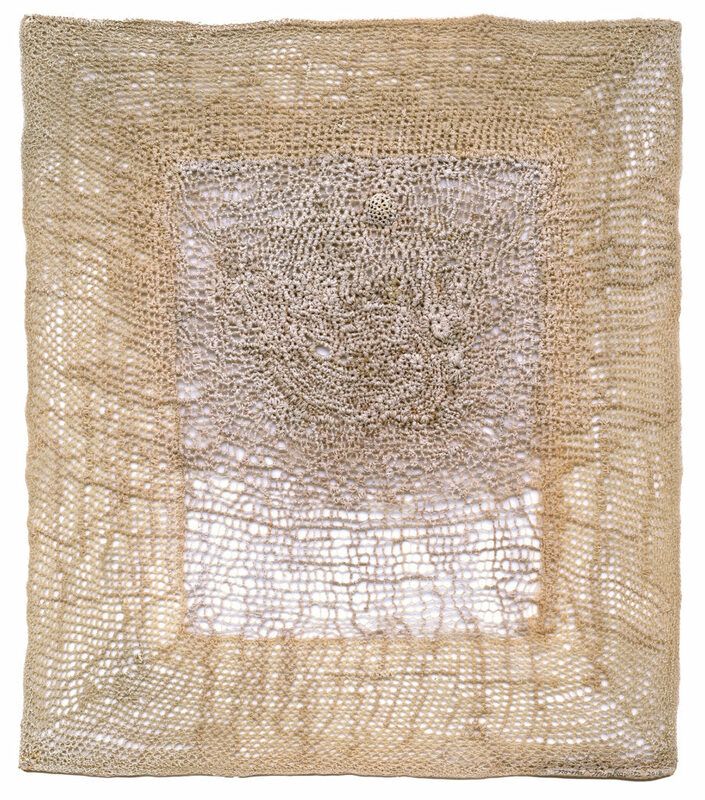 The fibers netting creates a surface that focuses on and highlights the lines I draw with the stitches introducing the concept of energy, message and movement. I often highlight these drawn lines with colors of paint. 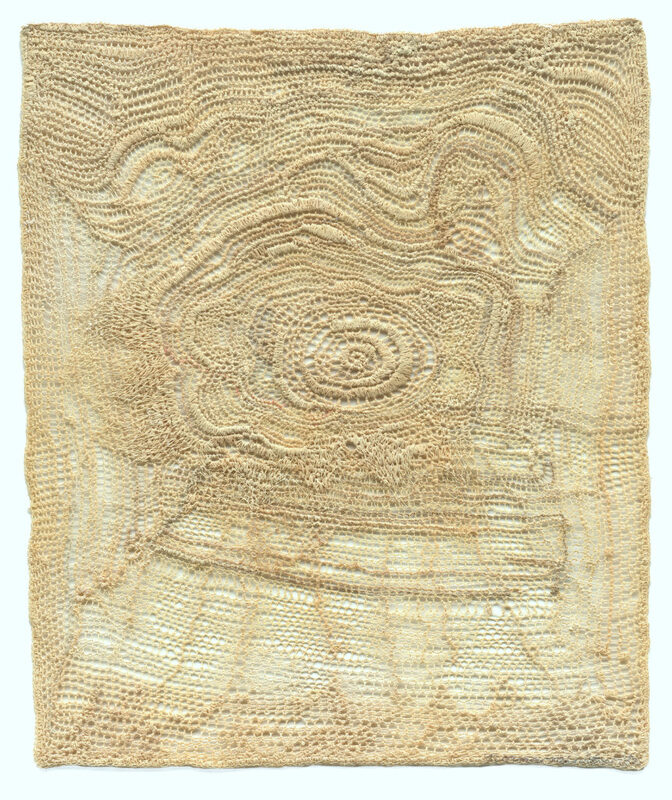 There is a crossover between the stitched line and the drawn line that contribute to my work that weaves the personal and universal together. 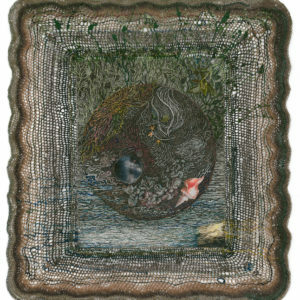 I use fiber as if I were drawing and often the drawn line as if I were stitching. I find them to be interchangeable. 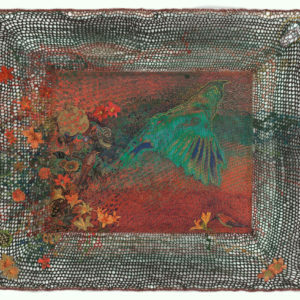 Among the various types of works, such as drawings sculptures, tapestries…which represents you more? I cannot separate the work, all of them overlap. 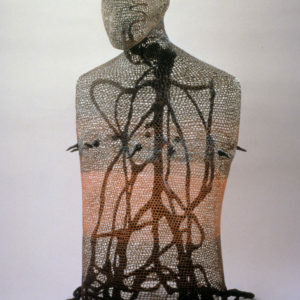 My sculptures on the surface are drawn on with fiber and my pen and ink drawings on paper also are drawn on with fiber. I do not make tapestries as I think of them as being woven, but I crochet. My wall hangings look like giant drawings as my threads cover the entire surface of the canvas of crocheted fiber background as I stitch on it .The result to me looks like very fine pen like lines. They are all equally representative of my work. 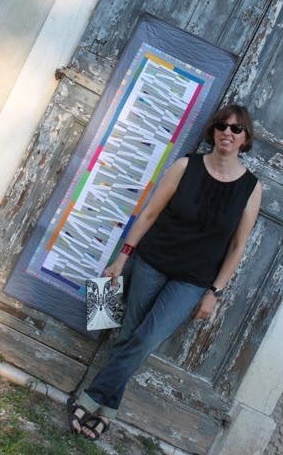 Can you tell us about your most recent textile work? 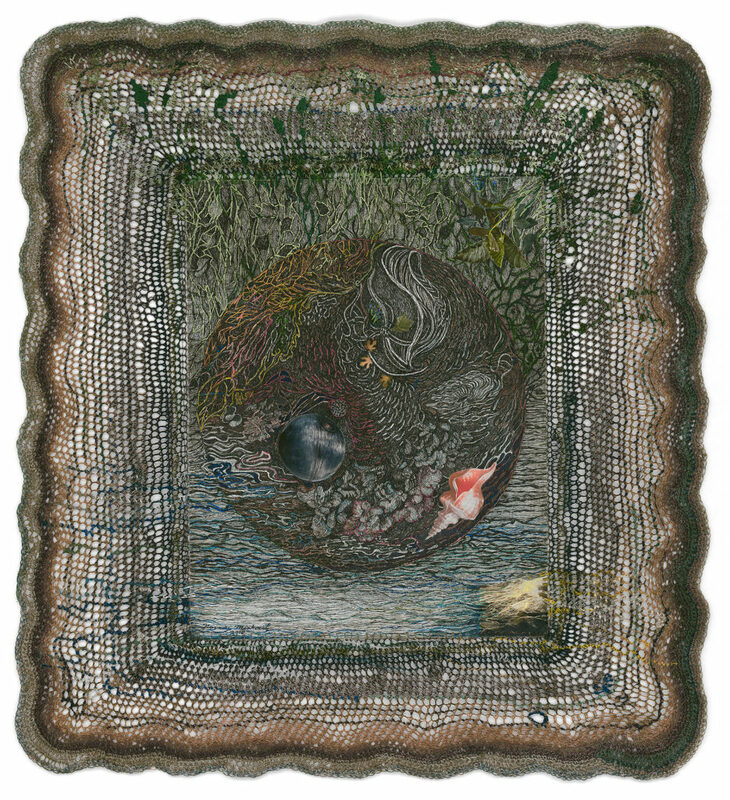 Recently I have been creating drawings that are stitched, collaged and drawn on with pen and ink, plus intricately crocheted borders. 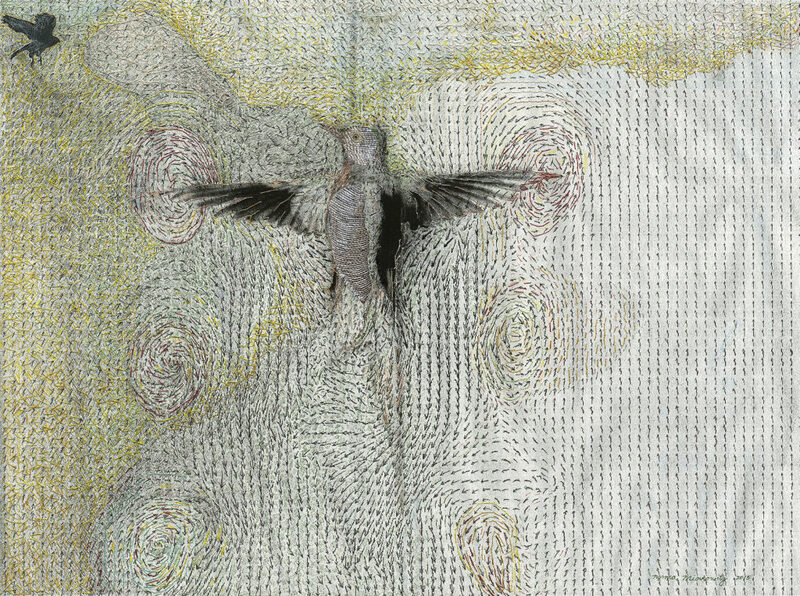 I have used digital prints on paper from a scientific publication of a graph that depicts Hummingbirds in still motion. 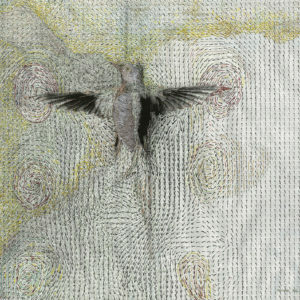 I have created about ten of these bird drawings as well as some with personal imagery. 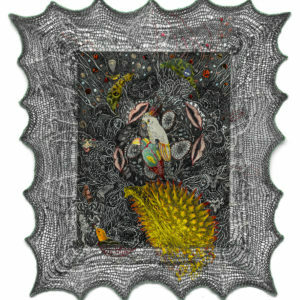 I am working on several large wall hangings by first crocheting the backgrounds and then stitching on the surface. I work on several projects at the same time. I need to contemplate my work for long periods of time and because of this I find myself starting new art work until I feel the need to go back to other works in progress. 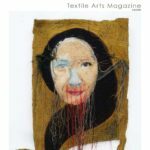 What do you think is the most important difference between a craftsman who works with threads and fabrics and a textile artist/ When does a fiber work become art? When fiber work is craft it is often repetitive and structured in technical skill and is more about how the work is made. 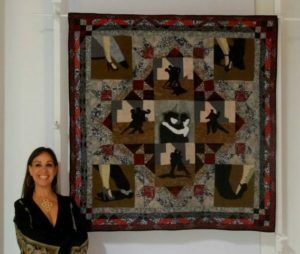 It is about using a specific technique in a masterful way that conforms to tradition (there are exceptions of course).Many quilt, sculpture and tapestry artists who work with traditional techniques are not in this category as they are artists making exciting one of a kind art. Fiber becomes art when it is about why it is made. There must be a message and a fresh concept within the content. The choice of materials becomes important in conveying that message while often using the technique in a new and fresh way. Photo sx: Journey Gift, 1987, Robert Arnold Collection, Museum of Texas. 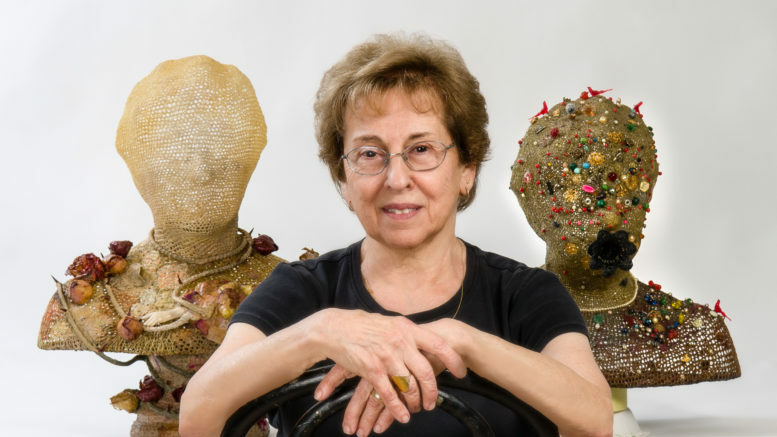 Be the first to comment on "Interview with Norma Minkowitz"